Auburn signee and All-American Zach Alvord is continuing his stellar season. Currently his South Forsyth War Eagles are tops in Georgia 7-AAAAA Standings. If Alvord ends up coming to Auburn it will be a big recruiting get for the Tigers. He’s a major league level talent who can contribute immediately. Here’s another profile of the talented SS. A reunion of sort last weekend when Auburn took on South Carolina. Dan Gamache and South Carolina’s Evan Marzilli were teammates at Rhode Island’s Bishop Hendricken High School. Bryan Matthews from “The Auburn Sports Blog” has some notes about Coach John Pawlowski addressing the errors that have been plaguing the Tigers. Mainly that Justin Bryant could see more playing time at 3B due to Alabama sending out more RHPs. Auburn got knocked out of the NCAA record books earlier this year when Missouri State and UT Arlington set an NCAA mark with 43 Strikeouts in a game. The 1-0 14 inning Win by UT-A saw 17 Mavericks and 26 Bears Strikeout. It topped a 17 Inning Game in 1994 between Auburn and Arkansas which had 25 Razorbacks and 16 Tigers K. It was an amazing game and one that Rod Bramblett said was “the best he ever called”. John Powell pitched 9 innings (0er/1bb/13k) and Ryan Halla tossed 8 scoreless (1bb/12k) for Auburn. The game was in the SEC tournament when the East and West teams played different “sub-tourneys”. Auburn would go on to the College World Series that year after upsetting National #1 Clemson in the Regional. Former Tiger Clete Thomas will start the year at AAA Toledo as his shoulder heals from taking a pitch earlier in the season. It’s a tough break for Clete who just missed making Detroit’s 25 man roster. He’ll get a call up later in the year, but I’m ready for him to have his first full season in the bigs. Gabe Gross has his assignment as well. 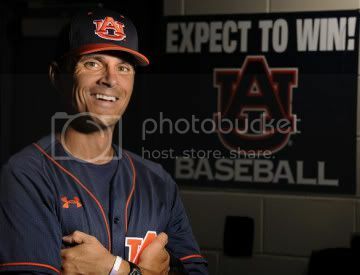 The former Auburn outfielder will be mainly a bench player for the Oakland A’s. Speaking of the A’s, Catcher Josh Donaldson was named one of the Green and Gold’s prospects to watch this season. Someone thinks highly of current Tiger Garrett Bush, naming him a player to watch in the 2012 MLB draft. Auburn signee and Prattville native Andrew Morris pitched his second no-hitter of the season for Gulf Coast Community College. He struck out 11 and walked 3. Morris should be an absolute stud next year for the Tigers and give Auburn a much needed right handed arm. Former Tiger Chris Bootcheck (above) is playing in Japan this season for the Yokohama BayStars, who recently held a youth camp. The movie “Bleacher Boys” about blind baseball aficionados is coming to Auburn. Random super supportive pull quote from Former Auburn coach (and ECU Alumnus) Hal Baird about Jeff Lebo being hired at East Carolina. Baird was interim AD when Lebo was hired. I watched the press conference that was linked in the article, and I kid you not, they introduce Lebo pretty much the same way he was introduced in Auburn. Mentioning how Lebo was a “hard-worker” and “gym-rat” and his success overall. Ton of Auburn signees are playing in and around Birmingham and AL.com has a profile here. Not really Auburn University Tiger related, but here are two solid articles about High School baseball around the Lee County area. The first about Lyman Ward returning to the diamond after a 25 years absence and the second about the different paths Opelika and Auburn High have taken after appearing in the 6A State Title game. I gave some more thoughts on the Alabama series over at Track Em Tigers. You can check it out over there. Finally, special thanks to my buddy Jake, who helped me fix the comments section of the blog. Everything should be good to go now and I look forward to hearing your feedback on the articles. Yeah! Shout out to me!